Explanation: Comet Hale-Bopp became much brighter than any surrounding stars. It was seen even over bright city lights. Out away from city lights, however, it put on quite a spectacular show. 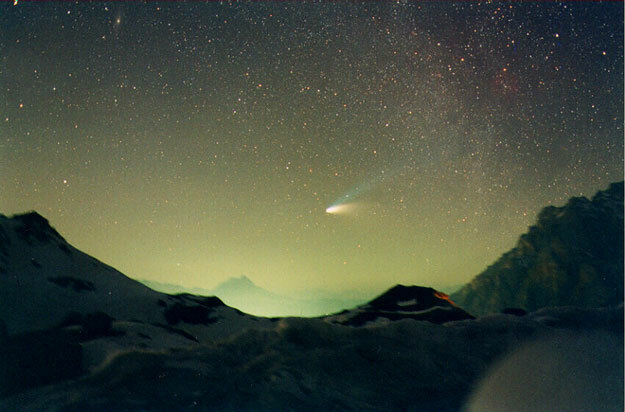 Here Comet Hale-Bopp was photographed above Val Parola Pass in the Dolomite mountains surrounding Cortina d'Ampezzo, Italy. Comet Hale-Bopp's blue ion tail was created when fast moving particles from the solar wind struck expelled ions from the comet's nucleus. The white dust tail is composed of larger particles of dust and ice expelled by the nucleus that orbit behind the comet. Observations showed that Comet Hale-Bopp's nucleus spins about once every 12 hours.